Peptide KDYPASTSQDSFEA(C), corresponding to amino acid residues 263-276 of human KV1.3 (Accession P22001). Extracellular loop between domains S1 and S2. Homology Rat, mouse - 12/14 amino acid residues identical. Preadsorption Control 5 μg peptide per 1 μg antibody. 1. Anti-KV1.3 (KCNA3) (extracellular) Antibody (#APC-101), (1:500). 2. Anti-KV1.3 (KCNA3) (extracellular) Antibody, preincubated with the control peptide antigen. Human lung carcinoma cell line A549 isolated nuclei (Jang, S.H. et al. (2015) J. Biol. Chem. 290, 12547.). Mouse retina (1:200) (Cangiano, L. et al. (2007) PLoS ONE 2, 1327.). Human B-cell lymphoma cells (Raji cells), (1:100) (Kawano, T. et al. (2009) Biol. Pharm. Bull. 32, 345.). ___ Cells + Anti-KV1.3 (KCNA3) (extracellular) Antibody (#APC-101), (1:25) + goat-anti-rabbit-PE. Human T cells (Beeton, C. et al. (2006) Proc. Natl. Acad. Sci. U.S.A. 103, 17414.). Cell surface detection of KV1.3 in live intact HEK 293 cells transfected with rat KV1.3 (panels A and C) or with empty vector (panels B and D) using Anti-KV1.3 (KCNA3) (extracellular) Antibody (#APC-101), (1:50). 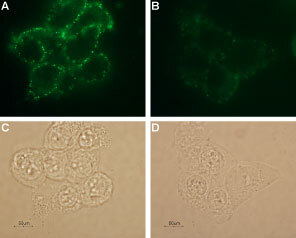 Staining (green) shows expression of KV1.3 in the transfected cells (A) but not in the cells transfected with empty vector (B). Panels C and D show the corresponding live image of the cells. KV1.3 belongs to the Shaker family of voltage-dependent K+ channels. The channel, encoded by KCNA3, is widely expressed in the brain, lung and osteoclasts and in several cell populations of hematopoietic origin. The prominence of KV1.3 channels in these cells (particularly in T lymphocytes) directed much research attention. It was found that KV1.3 is the main channel responsible for maintaining the resting potential in quiescent cells and regulating the Ca2+ signaling that is indispensable for normal T lymphocyte activation.1,2 Based on the central role of KV1.3 in regulating the initiation of an immune response, the channel has been recognized as a potential target for immunosuppressant drugs.1 The central role of KV1.3 in immune system cells created a real need for a specific antibody that would be able to work in flow cytometry applications. Anti-KV1.3 (KCNA3) (extracellular) Antibody (#APC-101) is a highly specific antibody directed against an extracellular epitope of the human protein. The antibody can be used in western blot, immunohistochemistry, live cell imaging and indirect flow cytometry applications. It has been designed to recognize KV1.3 potassium channel from human, mouse and rat samples. Szabo, I. et al. (2015) Cell. Physiol. Biochem. 37, 965. Vallejo Gracia, A. et al. (2013) J. Leukoc. Biol. 94, 779. Leanza, L. et al. (2013) Leukemia 27, 1782. Sanchez Miguel, D.S. et al. (2013) Biochem. Biophys. Res. Commun. 434, 273. Duque, A. et al. (2013) Develop. Neurobiol. 73, 841. Human acute T-lymphoblastic lymphomas (1:300). Cangiano, L. et al. (2007) PLoS ONE 2, 1327. Jimenez-Perez, L. et al. (2016) J. Biol. Chem. 291, 3569. Human umbilical vascular endothelial cells (HUVECs) (1:100). Yang, L. et al. (2013) Toxicol. Lett. 223, 16. Mouse leukaemia monocyte macrophage cells (raw 264.7), human Jurkat T-cells, human Raji B-lymphocytes. Human B-cell lymphoma cells (Raji cells), (1:100). Kawano, T. et al. (2009) Biol. Pharm. Bull. 32, 345. Beeton, C. et al. (2006) Proc. Natl. Acad. Sci. USA 103, 17414. Hajdu, P. et al. (2015) Mol. Biol. Cell 26, 1640. Gazula, V-R. et al. (2010) J. Comp.Neurol. 518, 3205. Vicente, R. et al. (2008) J. Biol. Chem. 283, 8756. Anti-KV1.3 (KCNA3) Antibody (#APC-002). This antibody recognizes a different epitope and thus can also be used as a control for detecting KV1.3. Guinea pig Anti-KV1.3 (KCNA3) (extracellular) Antibody (#AGP-005) is raised in guinea pig and can be used in immuno-colocalization studies in conjunction with any of our antibodies raised in rabbit. This antibody has been raised against the same epitope as #APC-101. Anti-KV1.3 (KCNA3) (extracellular)-Biotin Antibody (#APC-101-B). A biotin labeled primary antibody. It can be used in immuno-colocalization studies in conjunction with any of our antibodies raised in rabbit. Anti-KV1.3 (KCNA3) (extracellular)-FITC Antibody (#APC-101-F). This FITC-conjugated antibody can be used to detect KV1.3 in live cell flow cytometry. Anti-KV1.3 (KCNA3) (extracellular)-PE Antibody (#APC-101-PE). This R-PE-conjugated antibody can be used to detect KV1.3 in live cell flow cytometry. Guinea pig Anti-KV1.3 (KCNA3) (extracellular) Antibody (#AGP-005) is raised in guinea pig and can be used in colocalization studies in conjunction with any of our antibodies raised in rabbit. This antibody has been raised against the same epitope as #APC-101. Anti-KV1.3 (KCNA3) (extracellular)-FITC Antibody (#APC-101-F). A fluorescent labeled primary antibody. It can be used to detect KV1.3 in live cells. Anti-KV1.3 (KCNA3) (extracellular)-Biotin Antibody (#APC-101-B). A biotin labeled primary antibody. This antibody is the biotin-labeled version of #APC-101 and is ideal to detect KV1.3 in live cells.